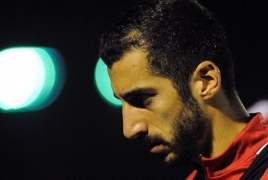 However, it looks as though Arsenal could be without Mkhitaryan for the clash after the club confirmed he’s still struggling with a ‘mild’ back strain.
. The Gunners have been boosted by UEFA’s decision to reduce Alexandre Lacazette’s ban meaning he is available for the game on Thursday. Sokratis was given a red card in the first leg and will therefore miss the clash at the Emirates.